Oregon trustee Norm Diamond has succeeded in correcting the labor history surrounding a new Portland bar named after the notorious Loyal Legion of Loggers and Lumbermen (4Ls). The welcome changes came after Diamond published his comments in the March 16 Northwest Labor Press. “The 4Ls was far from a union in any meaningful sense,” wrote Diamond. “It was a World War I-era organization specifically created by the U.S. War Department to undermine labor organizing in the woods (IWW) and mills (AFL).” In fact, the 4Ls, founded in 1917, broke a logger and lumber workers’ strike jointly orchestrated by both labor organizations. PNLHA secretary Lane Poncy and Portland trustee Jim Strassmeier signed up three new members after addressing the Eastside Democratic Club in Portland in October. Following a main speaker on Israel and Palestine, the PNLHA representatives introduced about 30 club members to the PNLHA’s work and mandate, particularly noting the availability of an oral history of respected Eastside Member George Starr. They stressed the ongoing series of labor programs broadcast on KBOO radio, mentioned recent activities of the Oregon branch of the PNLHA, and promoted the next conference on May 20-22, 2016, in Portland. 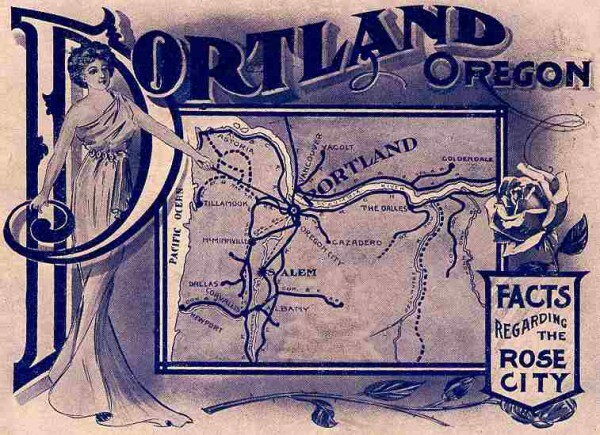 November is labor history month in Portland and the Northwest Oregon Labor Council’s labor history committee will celebrate it with a presentation of its 2015 program, “Portland: A Union Town” on Nov. 23. This year, committee members are compiling a timeline beginning with Portland’s earliest worker organizations and unions. The project, which includes narration and photographs, will highlight the numerous contributions to the community. Local unions are participating via a history committee survey, listing charter dates, contributions to our community such as improvements on the job and for public safety, apprenticeship programs, public education, job actions, boycotts, community service, charities, etc. 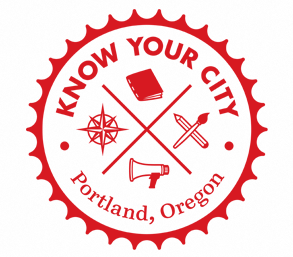 “Portland: A Union Town” will be introduced at the NOLC delegates’ meeting at the IBEW Local 48 Hall, 15937 NE Airport Way, Portland. The event begins at 7 p.m. on Nov. 23. Is interest in labor history waning? Labor historians from Canada and the United States grappled with the question of labor history’s allegedly diminishing role in the study of western history when they joined a panel at the 55th conference of the Western History Association in Portland on Oct. 24, 2015. The discussion ranged from a review of the status of labor history in Canada to its place in Asian and Mexican-American labor history. Some panelists agreed that the study of capitalism seemed in bigger demand among university students than the study of labor history. Others saw the insertion of labor history into such courses as potentially enhancing those studies. PNLHA member Jim Gregory’s positive assessment of progress in the U.S. was welcomed. Gregory, president-elect of the Labor and Working-Class History Association, noted that the panel was co-sponsored by LAWCHA. The five panelists and moderator Matthew Basso from the University of Utah reached no agreement on the question, but audience participation move the discussion to strategies for restoring any lost interest in labor history. Oregon PNLHA vice-president Ron Verzuh suggested that part of the strategy could include reaching out beyond the classroom to a public audience that would benefit from learning more about local labor history. Later in the conference, PNLHA member Laurie Mercier delivered her paper on left-led unions and their role in the struggle to achieve women’s equality. 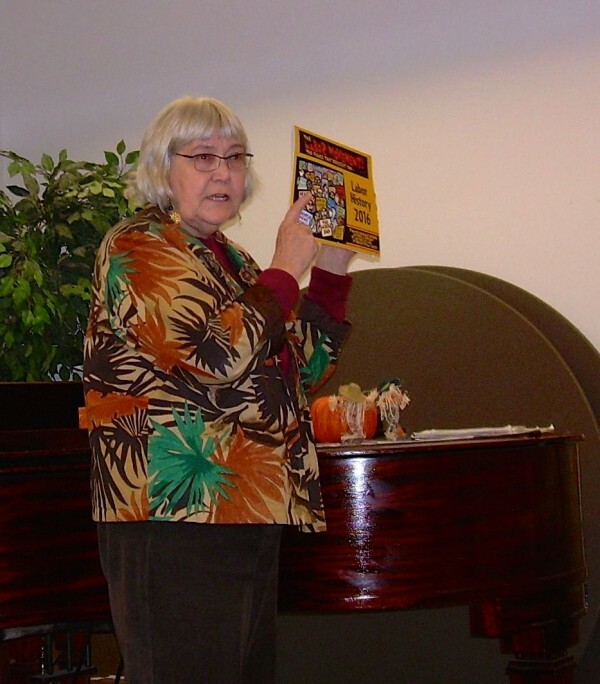 The PNLHA executive board has voted to endorse the Northwest Oregon Labor Council’s Nov. 19 tribute to legendary Wobbly troubadour Joe Hill. The board also agreed to send a contribution to assist with the event. The “Joe Hill Centennial Tribute” will celebrate Hill as a labor organizer, songwriter and martyr. * The evening will include music by veteran singer-songwriter and social activist Anne Feeney. 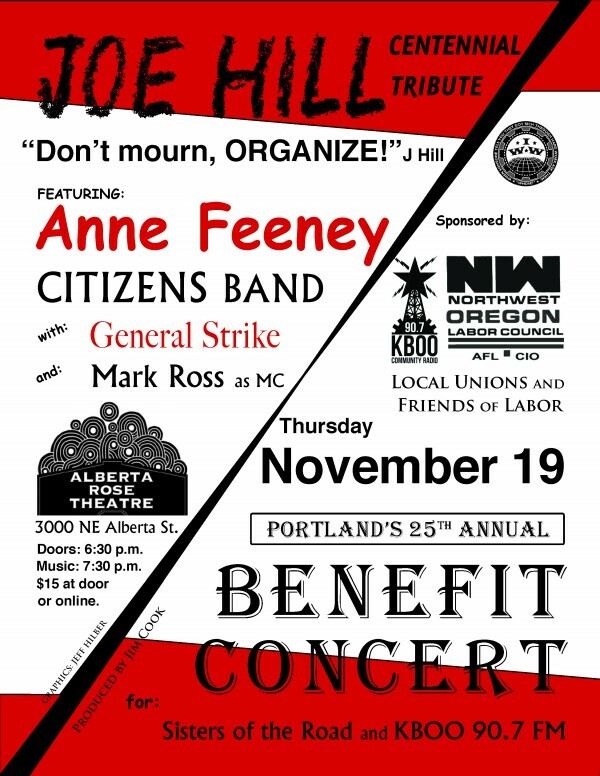 She’ll be joined by Citizen’s Band from Olympia, WA, and Portland’s General Strike. Eugene’s Mark Ross will act as MC. Portland has a long tradition of annually celebrating the music and spirit of Joe Hill and others each November. Organizers expect that Portland’s 25th Annual Benefit Concert will follow in that tradition and be an exceptional event in many ways. KBOO 90.7 FM, local unions and friends of labor are also sponsoring the tribute. Proceeds will benefit KBOO Community Radio and Sisters of the Road. The event will be held Nov. 19 at the Alberta Rose Theater, 3000 NW Alberta St. in Portland. Doors open at 6:30 p.m. The show starts at 7:30 p.m. Cost: $15. Order online at albertarosetheaters.com . *Joe Hill was shot and killed by a Utah firing squad on Nov. 19, 1915. 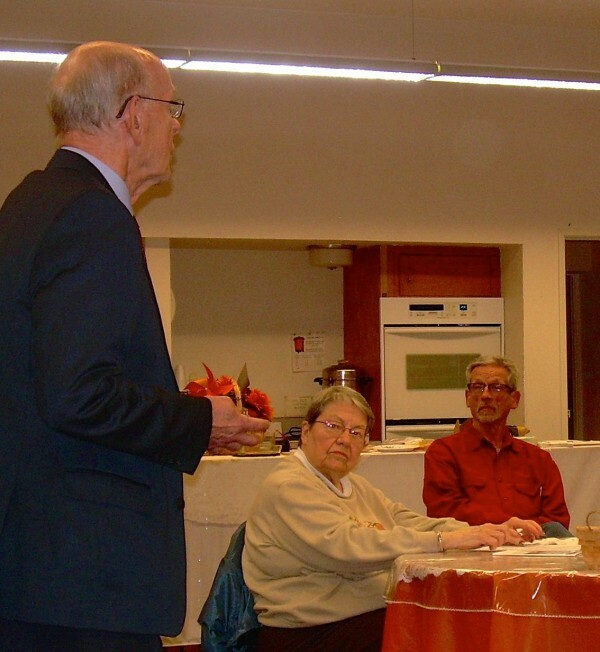 Trustee Jim Strassmeier, co-chair of PNLHA’s Oregon Labor Oral History Program, and PNLHA secretary Lane Poncy will discuss oral history and the PNLHA at an Eastside Democratic Party Club meeting on Nov. 3, 2015. The meeting will be held from 12 noon to 2 p.m. at the Grace Presbyterian Church building, NE 60th and Prescott. 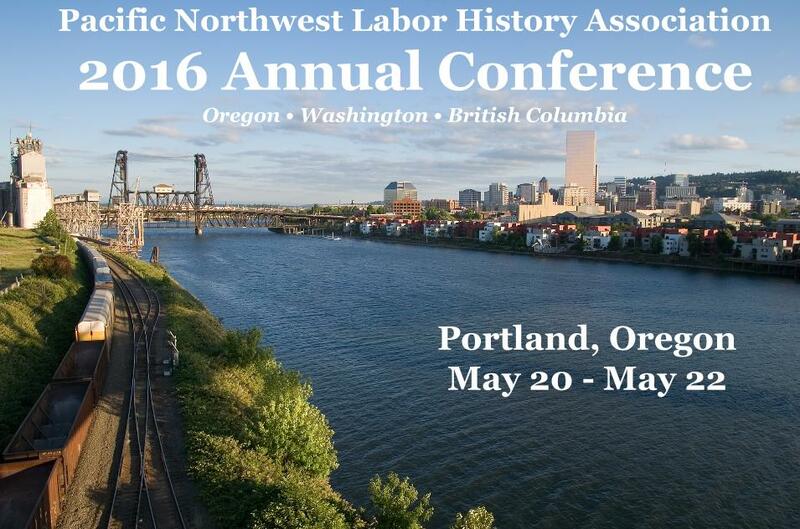 The Call for Papers for the 2016 conference of the PNLHA to be held in Portland on May 20-22, 2016, is now available.